There are no happy trails for some customers of a Middletown barn builder. Several customers of a Middletown barn builder say they're out thousands of dollars after the builder left both job sites and never returned. Robin Wachs hired Hess Buildings to build her a horse barn behind her home in West Suffield, but she said the project has cost her more than what she signed on for and it's not even finished. "He sold me that he was a horse barn expert, he knew how to lay it out," Wachs said. " He told me that when my barn was done, there was going to be water in the buckets, hay in the feeders, grain in their stalls. I could just walk my horses home and everything would be done." Wachs claims she paid Hess Buildings about $45,000 but estimates the company only performed $20,000 worth of work. She said a Hess Buildings salesman told her that her money had disappeared. Customers of a Middletown barn company say they're out tens of thousands of dollars after the builder left half way through their jobs. They turned to the Troubleshooters for help. "It was like a kick in the stomach," Wachs said. The owner of Hess Buildings, Bill Hesbach, told the Troubleshooters that his salesman was accepting the payments. However, the salesman, who is now no longer with the company, responded by saying he has 'no idea what Hesbach did with the money." Some of the work Hess Buildings completed for Wachs, including a partially red roof, does not impress her. Wachs hired other contractors to continue building what Hesbach started. She claims that has cost her another $10,000 to $15,000. Hesbach said he has only had two complaints in the past nine years, but he understands why Wachs is mad about the paint. But he said his company did 90 percent of the work for Wachs and he claimed he was asked not to come back to the property. Wachs disputes that claim. Hesbach also has an angry customer in Berlin, Massachusetts. Holly Kennedy-DeGruttola planned to open a horse boarding business. She hired Hess Buildings to build her a horse arena in 2010 based on his design and price. "He said six to eight weeks and it's now been two and a half years," Kennedy-DeGruttola said. According to Kennedy-DeGruttola, things did not start off smoothly because she had to pull the construction permits herself and Hesbach used her tractor to break ground. She said a pile of massive roof trusses sat on her front yard for months until Hesbach finally installed them. The horse barn still is not completed. There is no siding at the back of the arena and the lights were not installed. Kennedy-DeGruttola said she paid for both. She said she's paid Hess Buildings more than $140,000, but she estimates Hesbach only performed about $40,000 worth of work. "All he (Hesbach) did was basically put up the sides and again the roof and the reinforcement was done by another company," Kennedy-DeGruttola said. "Financially, it set us back and it made us not trust builders anymore." Hesbach indicated he could not comment in further detail about Kennedy-DeGruttola's arena, but said he put $92,000 into the project. That number does not add-up for Kennedy-DeGruttola. She's notified the Massachusetts Attorney General and put her own business plans on hold. "We have a lot to do before we can open, but we're gonna open," Kennedy-DeGruttola said. "It's just when, I'm not sure." 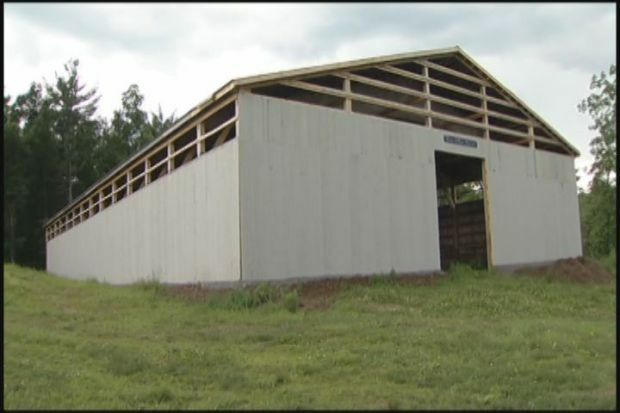 Hesbach said he is no longer building barns due to the economy. The Suffield Police Department looked into a police report filed by Wachs against Bill Hesbach. Hesbach said he cooperated and police told us it was determined to be a civil matter. Customers in similar situations can contact Connecticut's Department of Consumer Protection. The state can provide advice and possible remediation or they may pursue complaints further.